When I started developing my Light DJ app over 3 years ago, I never would have guessed that it would end up where it is today as one of the top Philips Hue apps on the market. One thing that hasn't changed since the start though is my continued desire to keep making new features. Users email me every day with cool new feature ideas and most of those eventually make it into the app. This has become a barrier to growth, however, since charging a 1-time fee does not bring in enough revenue to be able to dedicate all of my time working on it. As a result I've decided to change the app to a subscription-based pricing model. This will allow me to continue to put food on the table and start a family while I continue to create new features and work with more types of lights in the future. There's a ton that I'd like to do, too much to list everything here, but this is just a sample: SceneMaker playlists, Visualizer 2.0, Android tablet UI, AppleTV & Windows versions, camera-to-light support, multi-zone support for LIFX Tiles, Beams, and Z Strips, custom color themes, redesigned effect maker, improved UI flow between controllers, and much much more. These suggestions all came from fans like you who write to me and tell me what you'd love your lights to do. When you bought this app you entrusted me to give you a great light show. I believe in fair and honest work and getting what you paid for so it's only fair that if you own the fully unlocked app(either Light DJ Pro or Light DJ Deluxe, or purchased all 3 controllers from the Light DJ app) you'll continue to get new hardware and feature updates as they are released as a thank you for being a loyal Light DJ user. You'll get all of the benefits of a subscription user without having to pay. Pretty cool, eh? If you own any part of the app before July 2 you'll never have to pay again or lose features. Your purchases will continue to work forever. If you only own 1 or 2 controllers, they will still work after the switchover however you'd need to subscribe to the new service to fully unlock future features of the app (inc. new controllers, UIs, & new hardware support.) If you purchase the remaining controllers before July 2 you'll get upgraded to Pro/Deluxe and get the free subscription benefits as well. Switching to this new model wasn't an easy decision, but ultimately it's what's needed to keep bringing you new and exciting updates to the app. When I make these big changes my top concern is making sure that existing Light DJ users are taken care and will not lose any features or have to make any additional purchases as a result of this change. You helped get this app off the ground and I want to reward you by bringing you the best light show app in the world! Hey everyone, Kevin from Light DJ here. Philips announced their new Hue Entertainment API in January and that threw my priorities list off a bit, but boy was it worth it. I had been expecting a simple drop-and-replace solution with faster bulb response, but what they delivered was much more: a complete effects generation system that works seamlessly with your Hue lighting setup. When you create a Hue Entertainment area from the Hue app you'll set each of your light locations in your room. 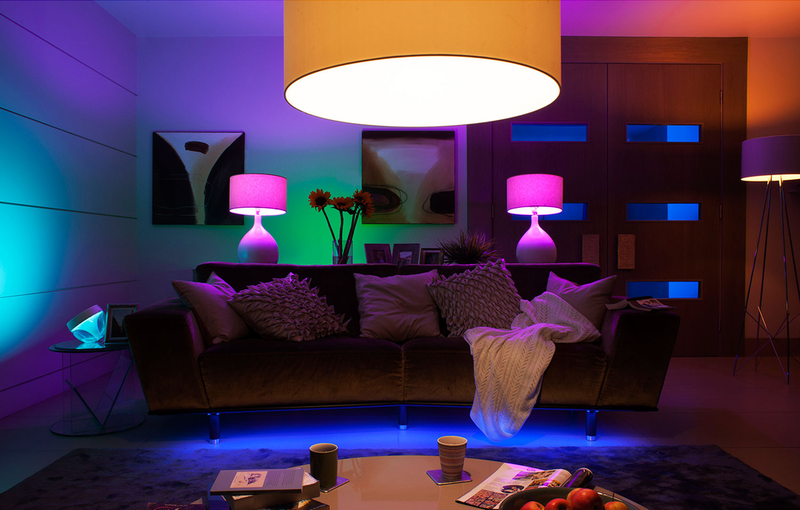 Each Hue Entertainment area can include up to 10 lights. Only one Hue Entertainment area can be controlled by a single bridge at any one time, however Light DJ allows you to control multiple simultaneous Hue Entertainment areas if you use a separate bridge for each area. By using a Hue Entertainment area you'll enjoy high-performance, spacial effects; all of the app's effects respond faster and with better sync. Send waves of color across your room with the updated Groove Wave effect, or see faster strobes with the Matrix controller. The Visualizer is more responsive and active too. You can try out all of the new effects for free today by downloading Light DJ on the App Store or on Google Play. If you like the new effects or have some suggestions, feel free to comment or send me an email at kevin@nrthrnlights.com. This app was build on user feedback and I value your input! Hey everyone! I've been working hard over the past few months updating the Android app with the popular SceneMaker Effects and Matrix Strobe Maker controllers from the iOS version. The SceneMaker controller has 23 different types of beat-matched effects. You get control of the effects, colors, and tempo and the controller will sync up the effects to whatever kind of music you’re listening to. You can take a peek at the effects here. The SceneMaker controller includes over 20 effects that will sync to the beat of your music. Setting the tempo is as simple as tapping the beat. Precision controls are also included. The Matrix Strobe Maker is an interactive controller that has 5 different effect modes and lets you create strobes and tap out patterns. It’s a fun toy that gives you a lot of immediate control over the lights. Along with the new controllers, I've also added an improved color selector to the Visualizer, so now you can pick any color! Tap, Swipe, and Drag your fingers over the Matrix controller to strobe your lights. Pick your own custom colors by tapping on one of the Active Colors. The updates are already available in Google Play. If you’ve previously purchased the Visualizer then you’ll get the other two controllers for free! One of my users emailed me recently asking for his lights to react to music, like some other light show apps. After downloading these other apps, I was SHOCKED to find out that they don't really do anything interesting. No matter though; I made something way cooler that blows these other guys out of the water! Introducing the Light DJ Visualizer, a Sound-Reactive controller that looks fantastic on both LIFX and Philips Hue systems. The Visualizer contains a powerful Intelligent Music Analyzer that actively listens to your music and changes the effects based on what it's hearing. The effects are smooth and flowy during softer melodies and energetic during louder parts. You can even sing into it! Of course, the new controller includes plenty of effect customization options so you can make your light show look how you want it to. Select up to 3 colors, or let the app decide the theme for you; it's smart enough to know when to magically change the colors at just the right time for maximum impact. It also makes sure you're never left sitting in the dark! Along with the Visualizer, the latest update includes another popular request: Background Mode. Now you can switch between apps without affecting the light show. Background Mode can be enabled via Settings. The update is available NOW in the App Store. Download Light DJ now and transform your room into the ultimate audio/visual experience! What else would you like Light DJ to do? Have any suggestions? Email me at kevin@mangobee.co or follow me on Instagram (@lightdj). Create light shows with ease with the all-new SceneMaker automated effects controller. The SceneMaker comes with over 10 effects that you can customize with your favorite colors. Brand new multi-color effects bring a new level of customization to your lights. The controller is designed to set and forget, so you can get your party on without having to oversee the app! This new controller replaces the old Effects controller. If you've already upgraded the Effects controller then you'll get the SceneMaker Basic Effects pack for free! You don't have to do anything except update the app to get the added benefits of the SceneMaker. As always, I love to hear your suggestion for the app. What would you like to see Light DJ do? Send your suggestions to kevin@mangobee.co.